Most commonly seen in children acquired via skin to skin contact while playing, immunocompromised individuals and in adults through sexual contact. They are smooth, shiny, pearly white or yellowish dome shaped in appearance. Treatment: Under local anaesthesia removal of lesions can be done, by needle or small curette. Age : commonly seen in children, sometimes even in adults. Vary according to duration, and progression of disease. It presents as multiple itchy crops of lesion which can be reddish, or fluid filled over red background, giving an appearance of “dew drop over rose petal “ , or even pus filled tiny lesions can be seen. They heal by crusting and till the crusts fall off, the individual is still infective. Initially face and trunk are affected which later on spread onto arms n legs as well as oral mucosa can be affected. Treatment:Antiviral oral acyclovir/ Val acyclovir with topical anti-itching medications can be taken as prescribed by the practitioner. Herpes zoster is reactivation of latent varicella- zoster virus in nerve root resulting in segmental or localised pattern or linear pattern in the distribution of nerve segment involved. 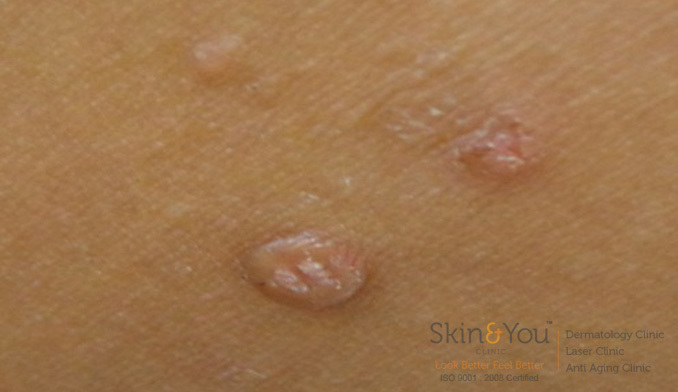 They present as painful tiny tense grouped fluid filled blisters, which can rupture on trivial trauma, leaving behind superficial erosions and heal by leaving crusts and scabs which fall off to leave scars. Lesions are accompanied or preceded by pain, excessive sensitive skin, tingling, numbness, fever or malaise, if on face even with facial deformities or hearing disturbances. Most common complication is Post- herpetic neuralgia, I,e, pain accompanying with the disease eruption can continue for months, after the initial lesions have healed. It can vary from burning in nature to painful in nature from person to person. More commonly seen in older age group, in cases of low immunity, and in patients undergoing organ transplants or chemotherapy. Diagnosis : based on distribution of lesion, constitutional symptoms herpes zoster infection can be diagnosed. Alongwith complete opthalmological and ear, nose , throat examination is to be done in cases of infection involving face. Oral acyclovir/ valacyclovir/ famcyclovir can be given for 5-7 days, along with topical soothing and antibiotic agents. For Herpetic Neuralgia : carbamazepine, lamotrigine or gabapentine can be prescribed for longer duration. Herpes Iabialis :It is localized infection, caused by herpes simplex type I infection limited to lips and area surrounding mouth. Herpes Genitalis :It is localized infection, caused by herpes simplex virus type II limited to genital region. Transmitted via sexual contact mainly. Fever, sore throat, fever, stress, low immunity, surgery, trauma. Treatments at Skin & You Clinic: Oral acyclovir/ valacyclovir should be taken for the prescribed period. Topical soothing agents with antibiotic can be prescribed to prevent secondary infection. Why Skin & You Clinic for Viral Infection? We, at Skin and you Clinic, assess, examine and treat all dermatological conditions with utmost care and with latest treatment options available.